Tennoji is one of Osaka’s downtown cores. This station is located on JR Osaka Kanjo line (Osaka loop line). This station is also connected with Kansai airport, Nara and Wakayama directly. It is one of very convenient places to stay and some of you think about staying around this station. You can take two Osaka Subway lines, Midousuji line and Tanimachi line at Tennoji. You can get central part of Osaka, such as Namba, Shinsaibashi, Umeda, Temmabashi, Tanimachi 9-chome (Uehonmachi) by subway lines. There is Kintetsu Railway’s Osaka-Abenobashi station. The name of station is different but Tennoji and Osaka-Abenobashi are same location. You can change JR and Kintetsu Railway at Tennoji/Abenobashi. In this post, I would like to show you the structure of Tennoji and Osaka-Abenobashi stations. You will find the information about how to change trains. Tennoji station is located on Osaka Kanjo line which is loop train line in downtown Osaka. Osaka Kanjo line connects Osaka (Umeda), Kyobashi, Shin-Imamiya, Nishikujo and many more stations. And Tennoji station is the terminal station to southern part of Osaka, Nara and Wakayama too. All limited Express train stop at this station. And also these following rapid trains stop at Tennoji. You can get Wakayama, Kansai airport and Nara by these trains. Tennoji station is two levels structure. On the ground level, all ticket gates, exit and platform #1 to #9 are located. The rest of platforms, #11 to #18 are located at lower level. It is not underground but it is a sort of open cut station. All platforms are connected by the bridge and the walkway on the ground level. There are elevators and escalators to lower level. The platforms on the ground level (#1-#9) are Hanwa line (to Wakayama) terminal. Most of train to Wakayama and southern part of Osaka depart from the platform on the ground floor. But the train goes through Osaka Kanjo line, such as Kishuji rapid (Osaka-Tennoji-Wakayamsa) arrives and departs from the platforms at lower level. I believe most of you do not use platform #1 to #9. JR Tennoji station has four ticket gates but most of you use two gates of these four. The biggest ticket gate is called “Central gate”. Central gate connects to four exit, North exit, Kouen (means park) exit, West exit and South exit. Central gate also connects to the entrance to underground path. You can access to Osaka Subway Tennoji station, Kintetsu Railway Osaka-Abenobashi station, and Abeno Harukas. There are two gates beside Central gate which are called Mio Main Building gate and Mio Plaza Building gate. These gates are connected with the shopping complex “Tennoji Mio”. And the fourth gate is East gate and East exit. You can access to Osaka Subway Midousuji line Tennoji station and Kintetsu Railway Osaka-Abenobashi station. Osaka-Abenobashi station is located in front of JR Tennoji station. It is same location but the name is different. Actually there are lots of same cases in Japan, such as JR Osaka station and other railway’s Umeda station. Anyway Tennoji and Osaka-Abenobashi stations are same location and you can transfer between these trains easily. Kintetsu Railway is the biggest private railway company in Japan. Kintetsu Railway has the terminal station in Namba. But the operation route is different. The trains from Namba go to Nara and Nagoya. The trains from Osaka-Abenobashi go to southern part of Osaka prefecture and Yoshino. Yoshino is one of the amazing place to see cherry blossom. Osaka-Abenobashi station is two levels structure. All platforms are located on the ground level. There are some platforms for arrival only. These platforms do not have any track numbers. Osaka-Abenobashi station has three ticket gates, West, Central and East. West gate is the biggest gate and located on the ground floor. Abeno Harukas is located beside this gate. This gate is connected to Osaka Subway Midousuji line Tennoji station and JR Tennoji station Central gate by underground path. Central and East are located underground. Central gate is very small and there are only machine gates. East gate is other primary gate in Osaka-Abenobashi station. You can access to Osaka Subway Midousuji line Tennoji station and JR Tennoji station from this gate too. You can catch two subway line trains at Tennoji station. Midousuji line is the primary line of Osaka subway lines. It connects all downtown core, such as Umeda (JR Osaka), Shin-Osaka, Shinsaibashi, Namba and Tennoji. Tanimachi line is other busy line in Osaka. It goes underground Tanimachisuji street and it goes near Osaka castle. And you can get Umeda (Higashi-Umeda) by this subway line. Midousuji line has three tracks and two platforms. Tanimachi line has two tracks and two platforms. Midousuji line is located just between JR Tennoji station and Kintetsu Railway Osaka-Abenobashi station. There are two gates, West and East at underground path between JR and Kintetsu Railway. Tanimachi line station is located near JR Tennoji station Central gate. There is one more train station in Tennoji station which is Hankai Railway’s station. Hankai Railway is a tram service which connects southern part of Osaka, such as Sakai. You can find this tram stop beside Abeno Harukas. I mentioned transfer among JR, Kintetsu Railway and Osaka Subway. But now I would like to give you the detailed instruction of changing trains at Tennoji and Osaka-Abenobashi stations. 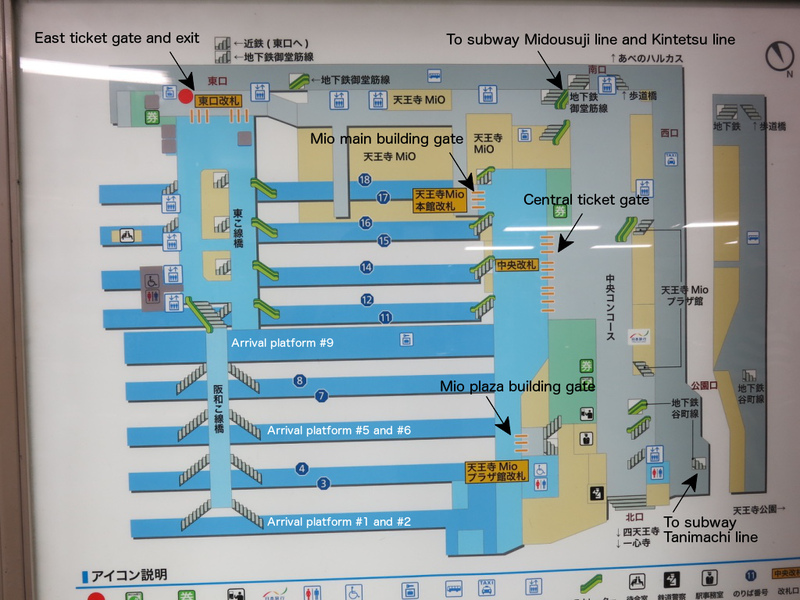 You will find the stairs and escalators near JR East ticket gate. Both ways are easy. When you get off the trains, make sure which way is closer. But it is not a big deal. Just follow the signage and find the way. If you take Midousuji line, you can take same ways above as transfer to Kintetsu Railway. Midousuji line ticket gate is located on the way to Kintetsu Railway ticket gate. If you take Tanimachi line, you can go through JR Central gate. And then exit at Park exit. You will find the stairs to underground. That is the entrance to Abe-Chika which is underground shopping complex. You will find the stairs to Tanimachi line station in this shopping complex. If you change trains between Kintetsu Railway and Midousuji line, you can take same way as transfer to JR. Midousuji line ticket gate is located on the way to JR. If you change trains to Tanimachi line, you can use Kintetsu Railway west gate. And go down to underground. You will find Midousuji line ticket gate. You can enter Midousuji line ticket gate to take Tanimachi line. These two lines are connected inside ticket gate. Just follow the signage or Tanimachi line to get the platform. Dear Takeshi, I will be taking Haruka train from Kansai Airport to Kyobashi (via Tennoji Station) at 9 AM on Wednesday. I have backpack and a small bag. Is it allowed to take backbacks in JR Osaka loop line? If not, is it advisable to take a taxi from Tennoji Station? There is no restrictions to bring your backpack in Osaka loop line. I will be arriving at Kansai Airport and proceed to USJ Osaka on the same day. I would like to take Haruka train to Tennoji Station to transfer to USJ. At the same time I would like to make some seat reservation at Tennoji station instead of Shin Osaka station? Is it possible? You can book a seat at Tennoji. Most of major stations in downtown Osaka have a reservation window and you can book a seat. You can do it at Universal city station too. I think you can make it. When you arrive in Tennoji staiton, find the direction to Central gate. Once you get it, follow the sign and exit there. And then turn right. You will find the way to get Tanimachi line station. You can make it in 10 minutes. Thanks Takashi, however I decided not to risk it in case my flight is delayed and I might end up stranded at the airport/Tennoji. I have booked an accommodation near to the airport. Thanks again for your help! We just go back from japan. Thank you for all information from your blog. Your infomation make our trip comfortable and smooth. Fyi, from shinsekai we can go through tennoji park to tennoji station without pay. From shinsekai go up to circular stair ( next west gate tennoji zoo) and find sky bridge to tennoji park. Then go through tennoji station. Reverse direction if we go from tennoji station to shinsekai-ebisucho-nippombashi. I’m happy to hear that you enjoyed staying in Japan. Thank you for updated info. Thank you for your previous advice. Since we have JR passes, we plan to take Osaka loop line to Tennoji Station to catch JR Haruka. Which platform in Tennoji Station do we get off from the loop line? I’ve checked the train schedule on 6/7, the loop line arrives in Tennoji at 7:34am, but Haruka departs at 7:38am. Do you think we will have enough time to transfer to Haruka which departs from platform 15? Thanks! Osaka loop line usually arrives at #11 or #12. It’s not impossible to change trains in 4 minutes. But Osaka loop line runs every 3 to 5 minutes in peak hours. You may take one or two earlier one to get Tennoji and you may change trains much easier. My husband and I with two teenagers will be staying in Osaka from 6/5 – 6/7. We will catch a plane on 6/7 at Kansai Airport at 10:40am to Hong Kong on our last day. We plan to leave around 7am, and we have JR passes. Imamiya Station is the nearest station to our hotel. Since it is around morning rush hours, should we take the Kansai Airport Rapid or Haruka Express? Also, should we transfer at Shin-Imamiya Station or Tennoji Station? Thank you very much. 7:00 is a bit earlier than peak hours. You will be okay. But I recommend you to take Haruka from Tennoji. It doesn’t stop at Shin-Imamiya. Rapid train is a kind of commute train. Haruka is more comfortable and it’s fully covered by JR pass. If i want to go to shinsekai from tennoji station, can i go through via tennoji park without paying ? I read there is one entrance we can go without paying. Do you know the entrance ? I don’t think you can go through it because most part of the park is zoo. But I’m not 100% sure. It’s so helpful to see this station guide before my trip to Nara (I’ll depart from Kansai Airport and transfer at Tennoji Station)! But I still have a question about how to transfer from Haruka / Kansai Airport Rapid Line to Yamatoji Rapid Line at Tennoji Station. Should I transfer on the same platform (No. 15)? Appreciate it very much if you could give more instructions! Haruka usually arrives at #15. Yamatoji rapid depart at #15 or #16. So you can change trains at same platform. I will be going to part of kansai which includes kyoto (4n), osaka(2n) and day trip to Nara with my parents on this coming October. I’ve done quite alot of research and studies on pros n cons of many different passes which might be useful n pay off for my trip but however im getting confused and confused where infact that i have actually been to japan for few times already *shame of myself*. Above are the technical itin for my family trip and i’ve been considering of buying Icoca&haruka tix / osaka kaiyukan pass / osaka eco card / kintetsu 5day rail pass / kyoto 2days sightseeing pass..
You may add Eco card for 20th and Osaka Kaiyu Ticket for 21st. But if you visit more attractions, you may use Osaka amazing pass. There are many more deals available for Osaka to KIX. Next Next post: Shin-Kobe station guide. How to change Shinkansen and Kobe city subway.